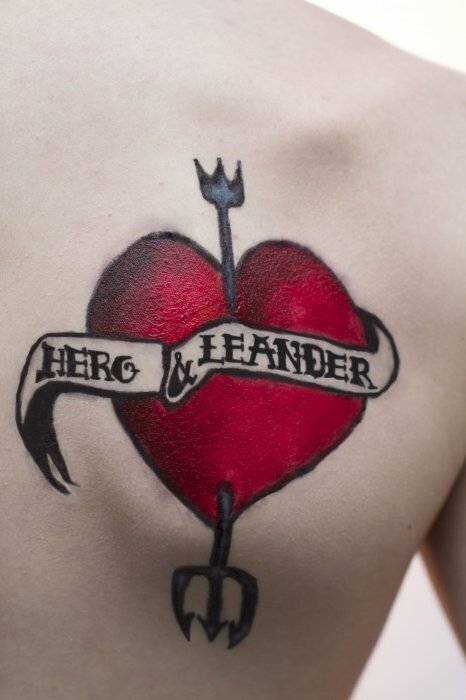 Another modern adaptation of an ancient myth participating in this year's SummerWorks Festival, Hero and Leander drags the tragic tale of two mortal star-crossed lovers who defy the gods into the forum of the Broadway musical with flair and a generous dollop of popular appeal. Created by Kevin Michael Shea (book/director), Scott Christian (music), and Wade Bogert-O’Brien (lyrics), Hero and Leander is a compact musical, focussing on only a handful of characters and eschewing bloated dance numbers for more meaningful moments. This doesn’t mean to say it isn’t an impressive production, on the contrary it’s highly polished and the effort invested into the piece is obvious. Shea’s script is highly accessible, portraying the gods more as spoiled and hedonistic Manhattanites concerned with their own well-being than as supernatural overlords concerned with the balance of the cosmos. Hero and Leander, the lovers, are equally tangible, each imbued with a modest realism rather than the emotional extremity one usually associates with the characters of such myths. Shea is particularly successful as both a writer and director in one memorable scene in which Hero and Leander speak over the phone with a gentle simplicity that melts the heart. The fact that the scene is performed in near obscurity leaves the audience listening more than watching, which in itself creates an incredible sense of intimacy. Christian’s score is filled with inspiring tunes that, while classically “Broadway” in tone, do draw from musical styles as diverse as jazz, torch songs, waltzes, and more. To hear an original score of such high calibre in the festival arena is a pleasant rarity. Bogert-O’Brien’s lyrics are sharp without being obnoxious. The cast is generally strong both vocally and dramatically, with Kimberly Persona dominating as Venus, the attention starved godess of love. In her performance, Persona channels one part Bernadette Peters and one part Cruella De Vil, getting laughs with every sigh and gesture and delivering each of her songs with skill and panache. At the other end of the spectrum, Fraser Elsdon as Leander sings a nice ditty, but is otherwise stiff in comparison to his stage mates. Another disappointment is the set; in contrast to the quality of the piece as a whole, it’s a shame that it looks relatively cheap and flimsy. Still these are small quibbles and are easily ignored. Hero and Leander is a touching tale about the necessity of fighting for love, and walks the line between art and broad popular appeal with a ginger step. Fingers crossed this isn’t the last Toronto sees of it.